Triple Profits Video Slot Guide & Review - Casino Answers! Triple Profits is a 3-reel, 3-row multispin video slot developed by Playtech, featuring a wild symbol, a hold feature and a bonus game. You can play the Triple Profits multispin slot at Bovada. Coin values on the Triple Profits slot machine are $0.01, $0.05, $0.10, $0.25, $0.50, $1, $2 and $5. You can bet 1-5 coins per spin on Triple Profits. To play the 5-coin maximum bet on the Triple Profits slot game, hit the “Bet Max” button. For all other wagers, press “Spin.” You can bet as little as a penny per spin on Triple Profits up to the highest total bet of $75 on a spin. On the first spin, you will spin the bottom row only. You can hold any or all of the symbols on the Triple Profits multispin slot on all three rows by hitting the “Hold” buttons at the bottom of each reel, then hit “Spin.” If you don’t like any of the symbols you are given, simply hit the “Spin” button. The highest paying symbol on Triple Profits is the Gold Bars symbol. 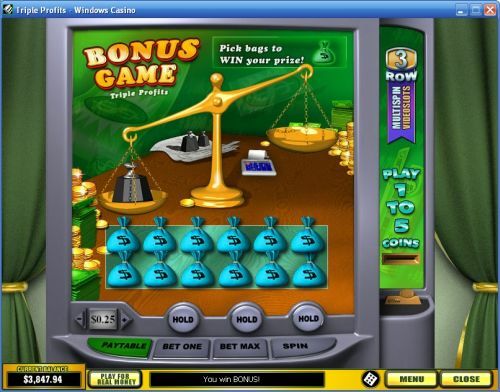 If you hit 3 Gold Bars symbols on a row on the Triple Profits slot machine, you will win the 1000 coin top jackpot. The Gold Bar symbol is wild and will substitute for all symbols in Triple Profits except for the Stack of Money symbol. If you hit 3 Stack of Money symbols, you will trigger the Triple Profits bonus game. You will get to pick three Money Bags (two if you didn’t play the maximum bet) to win a prize. You can profit big in the Triple Profits bonus game when you play Triple Profits at Bovada! There are 16 winning combinations on the Triple Profits multispin video slot. The full payout schedule is as follows (payouts in parenthesis): 3 Weights symbols (1), 1 Gold Bars symbol (2), any 3 of Scale/Safe/Calculator (2), 2 Gold Bars symbols (5), 3 Scale symbols (5), 3 of any Money Bag symbols (5), 3 Calculator symbols (10), 3 Safe symbols (15), 3 of any Dollar Sign symbols (15), 3 Blue Money Bag symbols (20), 3 Green Money Bag symbols (35), 3 Red Money Bag symbols (50), 3 Blue Dollar Sign symbols (50), 3 Green Dollar Sign symbols (75), 3 Red Dollar Sign symbols (100) and 3 Gold Bars symbols (1000). Triple Profits is a good multispin slot, albeit not great. Its main positive is the bonus game where you can win quite a bit of money. Other than that, it has a bit of a bland theme and not the type of presentation that you expect from Playtech nowadays. To play the Triple Profits multispin slot, you can sign up at Bovada. Can USA players play the Triple Profits video slot for real money? Unfortunately, American players are unable to play Triple Profits for real money at this time. For a great selection of slots American players can play, please visit VIP Slots Casino or read our VIP Slots Casino Review. 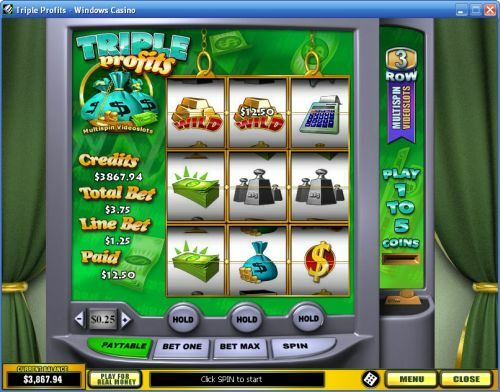 Is there an autoplay feature on the Triple Profits online slot? Due to its multispin nature, there is no autoplay mode offered on the Triple Profits slot machine. Is there a free Triple Profits Flash game that I can play anywhere? Yes, the Triple Profits Flash game is offered at Bovada. You can play for real money or you can play for free. If you have any difficulties with the Flash software on the Instant Play casino, try downloading the latest version of Adobe Flash Player.